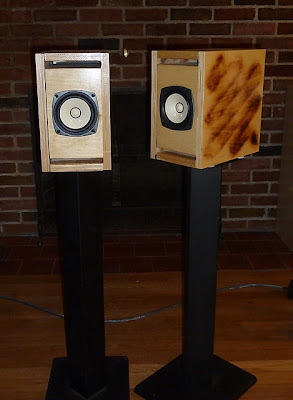 Happy New Year folks and welcome to our second installment of the DIY Audio, Hi-Fi and Music Roundup. The latest kit offering from Oatley Electronics is the K295 Stereo Tube Sound Line Buffer Amplifier Kit which retails for $36AU. The low cost, simple to construct, stereo tube buffer, lets you experience "tube sound". The kit is based around JAN 6418 sub-miniature vacuum tubes and designed for 100-120 or 200-240V 50/60Hz AC operation. These inexpensive tube kits can sound quite good, see Mark's review of the K272 Headphone Amplifier Kit and the recent review in audioXpress. 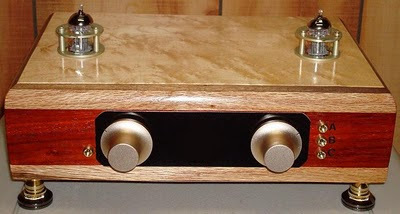 Via - Mark [K295 stereo JAN6418 tube buffer / preamp kit]. Decware has released the 8" Decware FRX Full Range Driver for open baffle loudspeakers. 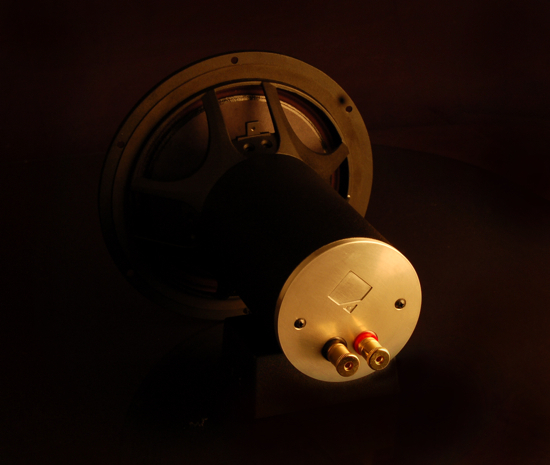 The unique driver is hand built and offers an extended ultra flat response made possible by it's electromotive coupling technology and powerful neodymium magnet. The exotic drivers retail for $595US each. Dimensions: A: 8.7", B: 7.2", C: 4.0" D: 9.8"
Shipping weight 15 lbs ea. The FRX represents an obsessive effort on my part to perfect the full-range point-source driver for Open Baffle speakers at a sane cost. While the build quality of this driver will compete with with other brands costing many times the price, I don't believe any of them will hold up sonically because of the side effects of high flux low mass designs. Side effects like the occasional shouty mid-range and forward presentation or ringing that comes with the tipped up response that is characteristic of these types of drivers. 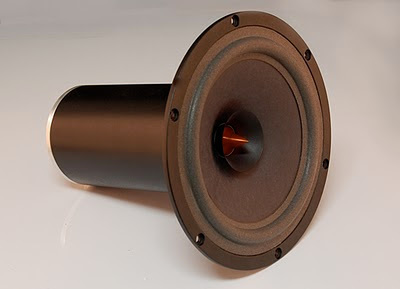 The FRX overcomes these side effects with a unique motor assembly that uses electromotive coupling between the amplifier and the voice coil. There is no other single driver in the world with this technology. I personally hand build these drivers to order. Build time on a pair of these fine drivers is 6 to 8 weeks. Kris at HIFI ZINE has tried out the Solo 103 enclosure with the new Fostex FE103En driver. The Solo 103 enclosure was originally meant for the Fostex FE103 (a.k.a. ACR FE103) and there have been many positive reports with the more recent Fostex FE103E. For full impression of the Solo 103 speaker with the new Fostex FE103En drivers see A Solo 103 Build. Bruce of OddWatt Audio has shared with us his ECC802S tube SRPP preamplifier design. 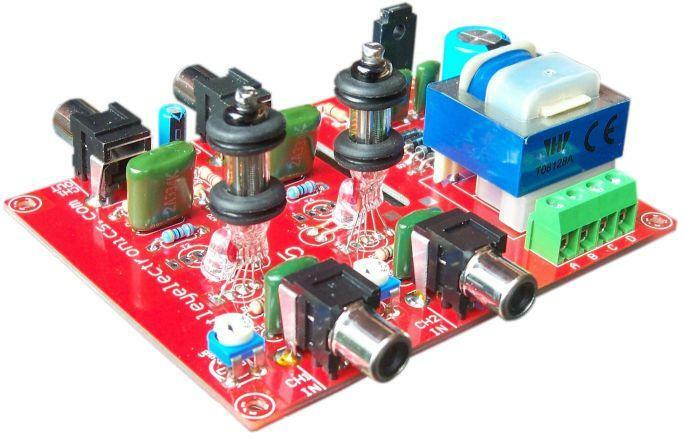 The preamplifier uses a solid state power supply and DC is used for the heaters. The gain of the preamp can be set at 7 or 11. 12AU7 and ECC82 tubes can also be used. For more information about this project, see the DIY ECC802S (12AU7 / ECC82) Vacuum Tube SRPP Preamplifier. There is a new annual audio and video show in Toronto, Canada. The Toronto Audio Video Entertainment Shows (TAVES) will be holding it first annual consumer audio, video and electronics show in Toronto in 2011. The show is scheduled for September 30 to October 2, 2011 at the King Edward Le Meridien. For more information, see the TAVES website. HDtracks is now offering select titles in full 24-bit/192kHz resolution. 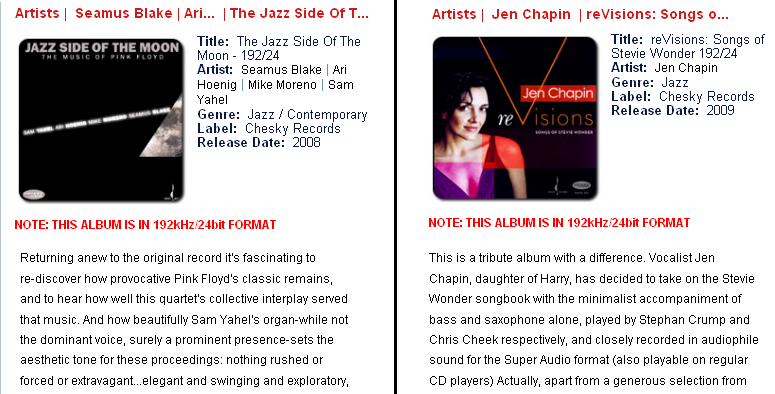 The currently available titles are Jen Chapin - reVisions: Songs of Stevie Wonder and The Jazz Side Of The Moon by musical artists Seamus Blake, Ari Hoenig, Mike Moreno, and Sam Yahel. Both titles are from the Chesky Recrods label and are priced at $26.98. Meet a man who makes sweet sweet music... A video showing the creation of a chocolate record that actually plays yummy music. Is that record made using pure virgin chocolate?